The name of the character is “Sorakara-chan”(meaning “a cute girl that has come from the sky” ). She will appear on occasions of PR activities, on the materials , TV commercials. and other methods of the Tower project. 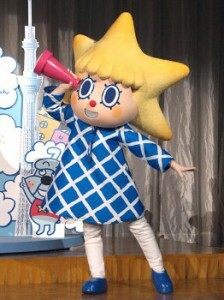 Sorakara-chan has a golden head with a star shape which actually represents “a star falling from the sky”. The local merchants’ association had already made an image character of the tower called “Oshinari-kun”, but the two characters are said to be good friends and work together in the promotion activities of the tower’s project from now on. 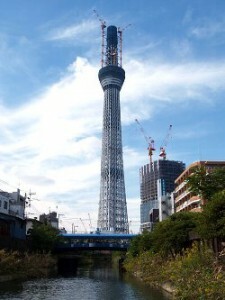 Tokyo Sky Tree in Sumida-ward Tokyo is finally going to become 634 m high when it is finished in 2012 and it has already become 497 m though still under construction as of this 27th. 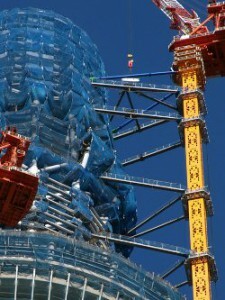 Everyday there are so many visitors or tourists who observe the construction of the tower from the foot.